Bundled up in coats with scarves wrapped around their faces and hats pulled over their ears, dedicated community members came out to support the unusually cold opening day of the 9th Denton Community Market season. As more than 80 vendors set their tables up, it was clear the toe-numbing 34-degree weather didn’t succeed in stopping this momentous day. Through the vendors’ smiles and excitement for the new season, there was a warmth brought to the freezing cold market. 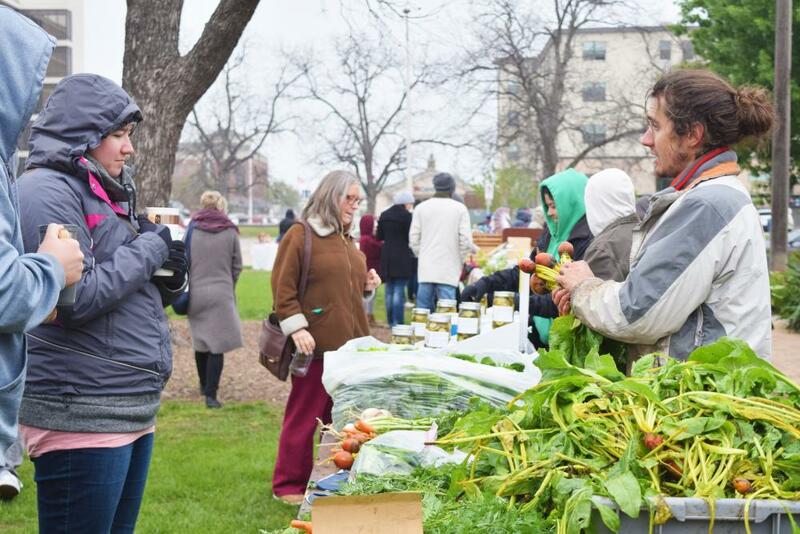 A community that shows up despite the weather to support local vendors is what the market is all about. The vendors represent who the market is, each one has a story tell about why they pour their time and energy into their handmade goods for the market. Walking back out to the backyard for what seemed like the 100th time, elementary school art teacher Rachel Milliken went to check on the concrete experiment she had hand-mixed and poured just a few hours earlier. Now, she was in the process of eagerly waiting for 24 hours to see if her idea would work. The anticipation built right up to the moment she slid the first concrete vessel out of its mold when she realized she had a chance to create something special. Since that sunny spring day in March 2016 when Milliken made her first vessel, she has gone on to create her own business, Cactus Makes Perfect, focusing on combining her appreciation of cacti with the handmade concrete creations she handmakes. “I just want to share my creativity with others, and I think a lot of people look over concrete because it’s an ordinary, everyday material that actually can be a really neat medium to work with,” Milliken said. The Denton Community Market is one place where she gets to share her creativity. She has been a vendor for two years now and has loved getting to be a local maker in the same community she was raised in. With the beginning of spring and a new market season, Milliken is excited to see old customers, who have become familiar faces, while also being surrounded by the other vendors who have become like family. From that exhilarating moment in her backyard when she held her very first vessel to now, Milliken has enjoyed getting to create and share her art with the community she has formed a special connection with. As she looks ahead, she can’t wait for another season full of connections with the community. Ben Chessman works on a small piece of farming equipment as a slight April breeze blows through the carefully tended rows of vegetable crops beside him. Inside their home, his wife Jade steps away from cooking to let their two year old son Elijah march onto the porch with a mission to help his dad. This is Jubilee Farm, the place where the Chessman family lives and grows their chemical-free, seasonal vegetables to sell at the Denton Community Market. They bought the farm in 2014, three years after they started to pursue their newfound passion of being farmers. The interest in farming initially came from Ben, who had always grown up with a garden and homegrown food on his plate. Now, seven years after meeting, the couple are both invested in the growth and success of their small vegetable farm that is only minutes away from the UNT campus. And while it’s not an easy passion, it is rewarding. 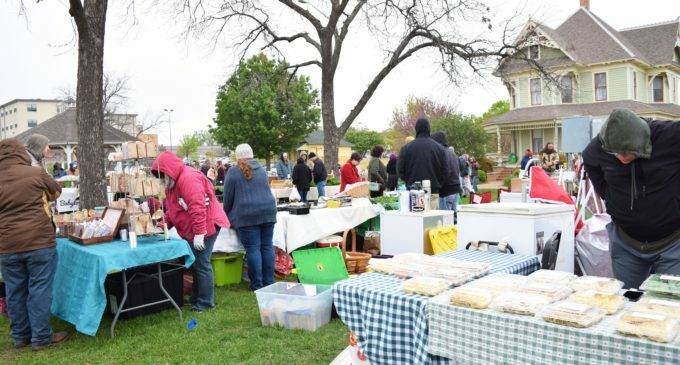 The Jubilee Farm joined the Denton Community Market as one of the first farm vendors six years ago and has been a part of it ever since. The constant support and encouragement from the community has played a big role in the growth of the farm. For them, the market is more than just a place to gather with their friends and supporters, it is a vital part of their lives as local farmers. Without the support of the market, they wouldn’t be able to make their dream of providing mindful produce for their community a reality. Sitting at the desk in her room with hundreds of different gemstones spread out over it, Texas Girl Treasures owner Melinda King searches for the right one to use in her next jewelry creation. Voices from an episode of “The Golden Girls” fills her workspace as the clock ticks deeper into the night. She strings each bead along carefully, making sure every part of the soon-to-be necklace compliments the gemstone she picked to pull it all together. These thoughtful, late-night moments spent creating jewelry serve as reminders to King for what she has dedicated her life to a passion she cares about. “It’s just kind of my time to myself where I can think and focus and create,” King said. 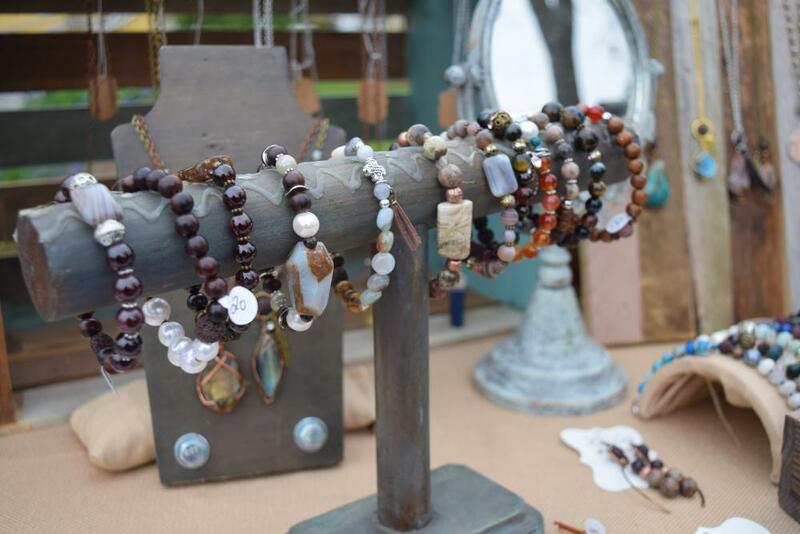 She started her jewelry business, Texas Girl Treasures, in 2006 and has owned and operated completely on her own ever since. For King, the jewelry she makes is more than just an accessory, each piece has a unique gemstone with a special meaning and includes a lava bead that makes it essential oil-friendly. Her dedication and passion for jewelry began when she was an art student at UNT and kept noticing unaffordable pieces of jewelry she liked but didn’t love. She realized she could create her own unqiue jewelry that she could enjoy and share with others for a lower price. 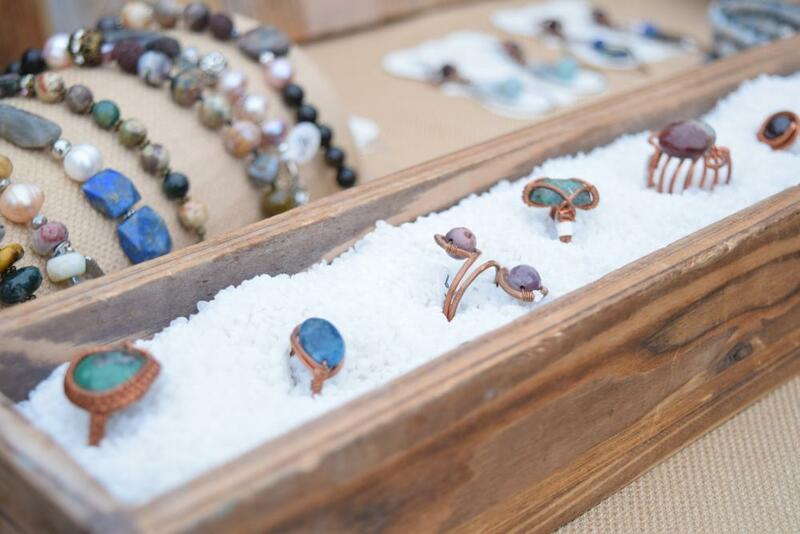 Her first venture into officially branding her jewelry business was when she joined the Denton Community Market as a vendor six years ago. The atmosphere of the community has kept King coming back every spring. With each new market season, King’s business has grown, but her late-night dedication to make the best jewelry possible for the market has remained the same. Continuing to bring unique, versatile pieces of jewelry is more than just something she has to do for a living: it’s something she gets to do for the community.